Farhan Akhtar who recently visited The first edition of FEST (Bhubaneswar City Festival) received a roaring response from the masses. 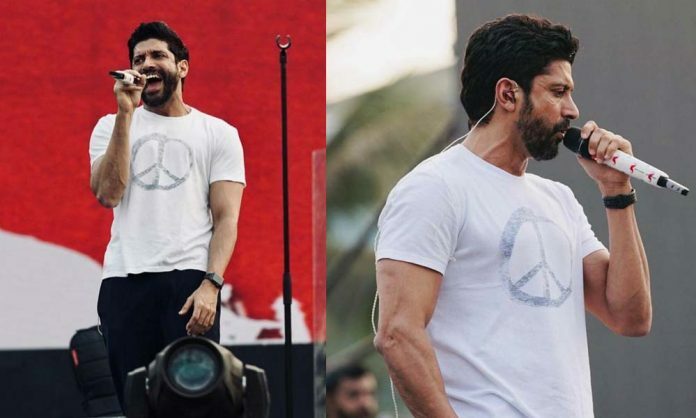 A flock of 30,000 fans welcomed Farhan with immense hooting and cheering as he took the stage with his accompanying talents. The actor was then greeted by loud applause as he broke into his first track, Sinbad the Sailor from his musical hit movie Rock On!! Sharing the picture, Farhan said, “Let’s dance.. put on your red shoes and dance the blues ~ D Bowie ❤ #farhanlive #bhubaneswar #musiclove #funtimes”. The actor-director-producer-singer’s songs have been widely loved and appreciated. It wouldn’t be wrong to say that he has now conquered the music industry with his concerts. On the work front, Farhan Akhtar will be next seen in The Sky is Pink. Previous articleURI’s New Action- Packed Dialogue Promo Out Tomorrow!